Thank you SO much for coming to visit the students at Kids in College. I am attaching some pictures for you. 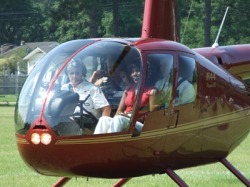 Steven and Denise had a great time flying with you. They both talked about how much they enjoyed the flight and how much fun it was. Denise wanted me to tell you, "Thank you a million times over!" Again, I want to thank you for donating your time and resources to talk with our students about the job you so enjoy.